Today’s coincidence isn’t a note-for-note piece of pilfering – it’s more of a general vibe*. 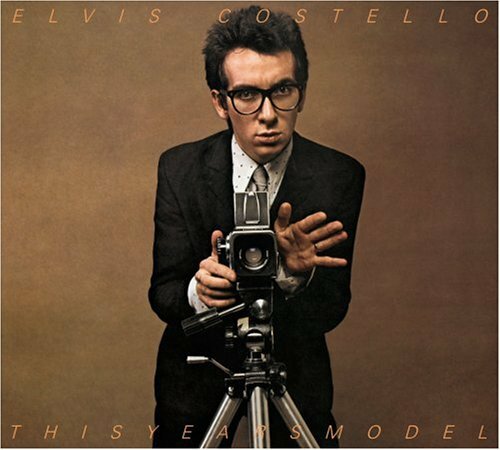 “Pump It Up” appeared on Costello’s second album, This Year’s Model (1978), an album I’ve already raved about. The song may or may not be about, shall we say, onanistic endeavours, but one thing is for certain: the main riff has been stolen by at least two other artists that I know of – and none-too-subtly, either. I know that the Rogue Traders fully acknowledged the lift (and gave Costello a co-writing credit), but that doesn’t make it alright. Some things are just plain unacceptable. Song of the day: Elvis Costello and The Attractions – "No Action"
“No Action” is the opening track of Costello’s second album, the still-astonishing This Year’s Model, an album that, for me, hasn’t dated one bit since it was first released in 1978. It’s still near the top of my list of all-time favourite power-pop albums. A lot of people probably don’t think of Elvis Costello as a power pop artist at all, and never have. Most people think of him as rock’s original Mr. Bitter, or as Punk‘s First Man of Letters due to his exceptional wordplay (during the punk period, most artists around him were simply yelling “Destroy!”). Although he later dabbled in other genres such as country and lounge, I don’t think Elvis’ music has ever been considered power pop. Yet I think This Year’s Model is a Grade-A power pop album – it’s full of great tunes and has boundless energy. As far as I’m concerned, that‘s power pop. Now, listen to those tracks and tell me that’s not power pop.